Backdropped by the blackness of space and Earth's horizon, the International Space Station is seen from Space Shuttle Discovery as the two spacecraft begin their relative separation. The Russian space agency stated that it intends to develop aspace platform from which missions to the moon and to Mars could be launched.According to agency director Anatoly Perminov, the space platform projectshould be up and working after 2020. Russia plans its first moon mission for2025. 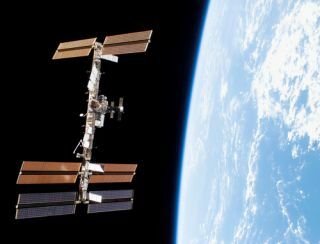 The International Space Station will be decommissionedsometime between 2015 and 2025; by that time, the new space platform should beavailable. As far as I know, the phrase "space platform" wasfirst used in a scary short story by E. B. White. His short story,"TheMorning of the Day They Did It," was published in The New Yorkermagazine in 1950. "We had arranged a radio hookup with the spaceplatform, a gadget the Army had succeeded in establishing six hundred miles up,in the regions of the sky beyond the pull of gravity. The army, after manyyears of experimenting with rockets, had not only got the platform establishedbut had sent two fellows there in a Spaceship, and also a liberal supply of theNew Weapon." The concept of a space platform is at least several yearsolder. In an annual report delivered by Secretary of Defense James Forrestal in1948, an "earth satellite vehicle program" was mentioned. Forrestalremarked, "The earth-satellite vehicle program, which is being carried outindependently by each military service, was assigned to the committee on guidedmissiles for coordination." It was specifically described as a platformfrom which missiles could be launched; it could function as an unmannedstation. Several years earlier, in 1946, General Curtis E. LeMay mentionedsomething similar in a research program announcement. He called for"flight and survival equipment for use above the atmosphere, includingspace vehicles, space bases and devices for use therein." Via Russiaplanning new space platform. See also Fortress on a Skyhook.